The first time they butchered my name on a cup I was deeply disappointed but not enough to correct the barista. They had enough problems keeping up with the drink orders, didn’t they? Deeply disappointed, you ask? Over a misspelled name? What, after all, is in a name? Just everything; identity, belonging, all that you are. It’s the first thing your parents do, they name you. 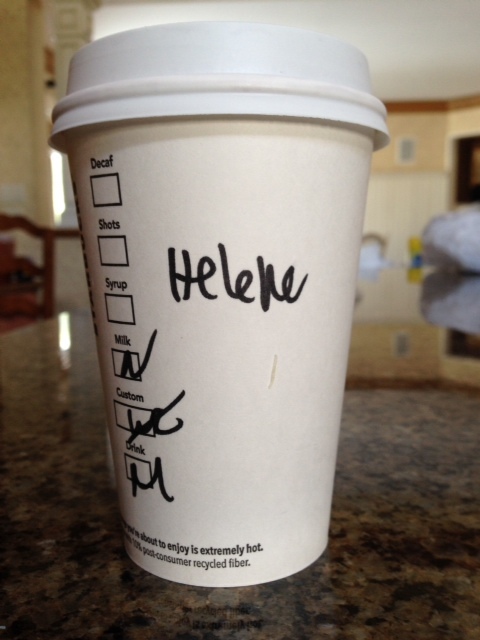 And, as it turns out the number of ways you can misspell Helene are as limitless as the stars in the sky and many of the ways were so creative that I wish I had kept all of the cups with my misspelled name just for a hoot. Time moved on and so did we, to a new town and a new Starbucks and I had the opportunity for a clean slate. So at the new Starbucks when they asked for my name, before I could stop myself I said, Pam. You can’t get Pam wrong. It just can’t be done. And, each time thereafter when they asked for my name I said Pam because once you’ve fallen into a hole unless someone hands you a ladder it’s hard to climb out. They never ever misspelled Pam but I never for one second felt good about this foolish, petty deception. A friend saw Pam on my cup and asked why my coffee cup said Pam? And I was compelled to launch into the whole asinine explanation of my Starbucks alias and then in yoga class they saw my cup and begin to call me Pam. The effort to avoid spelling H E L E N E has ended in long explanations of why my coffee cup said Pam. What in the end have I gained? Then after three years of frequenting this new Starbucks the workers there start to become familiar with me and after a three-day absence the barista says, “I’ve missed you Pam.” That’s when I crack. I’ve never been a good liar so I lean across the counter, “My name is really Helene I whisper. “What?” she asks. “My name is not Pam,” I say a little louder this time, “Pam is my Starbucks alias. My real name is Helene.” Oh she says looking at me oddly. But, no matter, because I feel lighter, no longer burdened by my alias. Let P A M get her own damn drink.